There are several possibilities in terms of types of activity you choose to fulfil your intended outcome. There are advantages and disadvantages to each and there may be a difference between what you would ideally like to do and what is logistically possible. Some projects may include multiple types of activity, e.g. an introduction/follow-up session at school followed/preceded by a university visit. Workshops at the university. Arguably, pupils visiting the university to take part in an activity has the most impact. It is an experience outside the everyday which allows teachers and school pupils to see what facilities are like at a university. Enabling school pupils to work with researchers in a university setting is often very powerful in terms of enabling them to understand what research really entails. It also helps them to view the researchers as human beings rather than being intrinsically different to their view of themselves. However, getting pupils and teachers to the university can be difficult to arrange due to the time pressures of the school curriculum and the incompatibilities of the school and university academic years. Due to these factors it is important that activities that take place at the university make full use of facilities or equipment that are not available at school. Workshops in schools. University staff visiting schools can remove the logistical difficulties of getting pupils and teachers out for the day. It may also mean that larger numbers of pupils can be reached through repeating the session with a number of classes or by leading assemblies. Mentoring activities where there is prolonged, in-depth engagement with the same pupils for a specific purpose may also work best if university staff visit the school. This is also true of any training that may be offered to teachers unless it relates to a particular piece of equipment or facility that can only be accessed at the university. Engaging pupils in their own environment may also be beneficial, especially at the beginning of a partnership, in avoiding feelings of intimidation. However, there is a danger that researchers will be viewed as ‘just another teacher’ if they cannot offer something different. Not every activity will involve the same level of engagement. Often there is a trade-off between the depth of engagement possible and the numbers of pupils involved. Each level of engagement is valuable when used in the right context. Minimal engagement: Pupils are observers of a demonstration, followers in a tour or the audience of a lecture. There is relatively little opportunity for them to actively take part, ask questions or learn anything through their own investigation. Good as an introduction or spark of inspiration. Light touch engagement: Pupils take part in one-off planned practical workshops, record their opinions and learning or take part in discussion groups. Active engagement: Pupils take part in proactive problem solving workshops, produce resources for other learners or complete follow-up content to support their learning in a particular session. Teachers and researchers are given more opportunities to implement training received. In-depth engagement: Pupils, teachers and researchers work together to co-develop research projects. These can focus on pupils as researchers in the classroom, and enable teachers to carry out research into their own practice or contribute to researchers’ academic output. 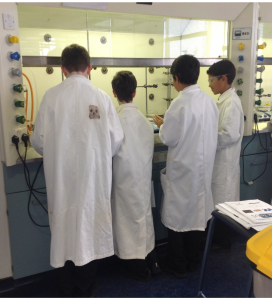 Year 8 pupils use the fume cupboards in the Chemistry teaching labs to investigate fossil and renewable fuels. Different activities or facilities make it possible to accommodate different numbers of pupils. It is worth bearing in mind that school classes are usually 30 or lower. For timetabling and other logistical reasons some schools will prefer to bring whole classes to an activity. However, if this number of participants will impact upon the quality of their experience it may be worth considering other options. For instance, running the activity two days running for 15 pupils each day or splitting the class and running two concurrent activities could be more beneficial for students. · What rooms or labs will you need? · Will you need space to store belongings or a space for lunch? · What consumables you will need to complete the activities? · What equipment will you need? · What stationary will you need? · What teaching materials will you use? Worksheets, electronic presentation, smart board, film clips etc. · Do you need to discuss with a technician? Can they help you set up? · Information pack – joining instructions, meeting points, travel arrangements, contact list. · Risk Assessments – you will need one for each activity you complete. Most institutions will have a template system and generic ones will exist for moving a group of pupils around campus. You will need to share these with everyone involved, including the teachers/school(s). See Appendix 5. · DBS – Disclosure and Barring Service Advanced Disclosure replaced the old CRB check and will be required by any university staff who will be working with pupils while unsupervised by teachers or other school/university staff with DBS. You can find information on how to apply at: www.gov.uk/government/organisations/disclosure-and-barring-service. 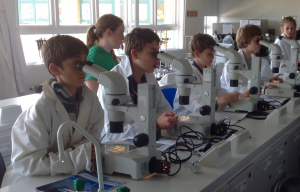 Pupils identify the plankton samples they have collected from Southampton Water.